TORONTO – With the Maple Leafs’ offence all but drying up in the midst of their current two-game losing streak, Mike Babcock had to administer a little tough love to his team before Sunday’s practice. Toronto had started this season winning six of their first seven games, and leading the NHL with 33 goals for. But in these last two outings against Pittsburgh and St. Louis, the Leafs were outscored by a combined 7-1 and looked like a shadow of that former offensive powerhouse. It’s rare the Leafs will gather for practice on Sunday, but with three days off between Saturday’s loss to the Blues and Wednesday’s game in Winnipeg, there was opportunity to deviate from the usual schedule. After going through “the nitty gritty” of their two losses, the Leafs will re-convene on Tuesday to discuss everything they’ve done well through nine regular season games and how to start succeeding again. That’s the mantra Travis Dermott has been recalling since he was first called up to the NHL last January and he continues employing it now. Dermott was a team-worst minus-three in Saturday’s loss and involved in negative plays on each of the Blues’ first three goals. By Sunday, Dermott had been pushed down to the Leafs’ fourth defensive pairing with perennial healthy scratch Justin Holl at practice. Earlier this week, Babcock said he has no plans to get Holl in a game soon, which doesn’t bode well for Dermott’s prospects as his new partner. Up until facing the Blues, the 21-year-old had been having a good start to his season, posting a team-high 58 per-cent possession with one assist and a minus-two rating through eight games. While acknowledging he’s made “some mistakes” in the season’s early-going, Dermott wasn’t sweating the change or whether it meant a healthy scratch was coming. Babcock was non-committal on potential changes to his lineup, saying only, “I have lots of time to think about that.” It’s possible the practice demotion was Babcock sending a message to Dermott, who he previously singled out in training camp as needing to work like he was still trying to earn a job. 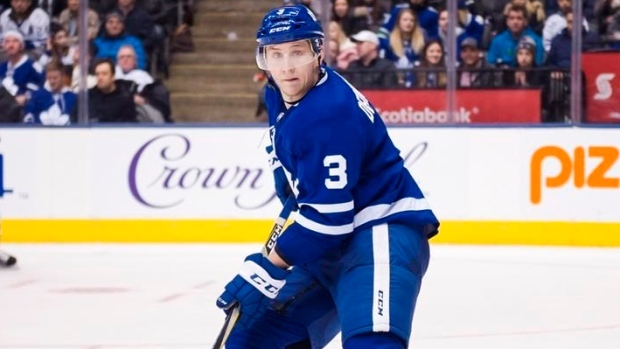 When asked specifically about Dermott’s previous game, though, Babcock identified his defenceman’s problems within the bigger picture of those plaguing his entire team. To that end, the Leafs opened practice with transition drills and working on clean breakouts, something that hasn’t been very consistent for Toronto in recent games. Basically, the Leafs are getting back to the basics. Morgan Rielly said after Saturday’s loss it was on the players to get better prepared for each contest and “grind” as hard as opponents are prepared to in keeping the Leafs’ offence dormant. With the “fantasy tour” of early-season scoring behind them for now, Toronto can focus on executing its own necessary adjustments in getting back on track.